The road south from Germany to Italy is perhaps one of Europe’s most scenic routes. Made famous by Goethe’s 1816 novel ‘The Italian Journey’, depicting his departure from a life in Germany (at the then mid-life-existential-crisis age: 37) to an altogether more romantic sojourn south. The lure of the open road was made even more pleasant by avoiding the sombre tunnels through the Alps, switching off the GPS (for a while, at least) and taking in the spectacular surroundings along the way. The journey was long but in a camper van bedecked with a roof-raising loft bed, ample storage, picnic table and chairs, and even a kitchen sink, we were lulled into a transient daily routine. Navigating the exhilarating series of roads in the mountains of Austria, known simply as the Alpine route, our journey was propelled from the bustle of Germany’s principal cities to an abundant series of picture-postcard scenes. Western Austria’s Innsbruck made a fitting stop—the city, which is renowned for its 1964 and 1976 Winter Olympic games, is home to Zaha Hadid’s Bergisel Ski Tower. The tower and ramp were opened in 2003 with a viewing terrace at almost 50 meters high—the perfect vantage point from which to shoot the city hugged by the Alps—and, as it turned out the mist, fog, and heavy rainfall, too. The striking silhouette of Bergisel in the grey served to extend the natural fluidity of the slopes up to the Alpine bleak sky—a dramatic scene only to be beaten by a sunny snow day captured when ski jumpers are in training. The gateway to the Dolomites, South Tyrol is the northernmost point in Italy and a region as rich linguistically as it is fertile: Italian, German, and the local minority language Ladin are all spoken and the climate affords the area to be the largest fruit growing region of Europe (particularly for apples). Traveling further south, we found lush valleys were replaced by flat farmlands spiked with cypress trees. 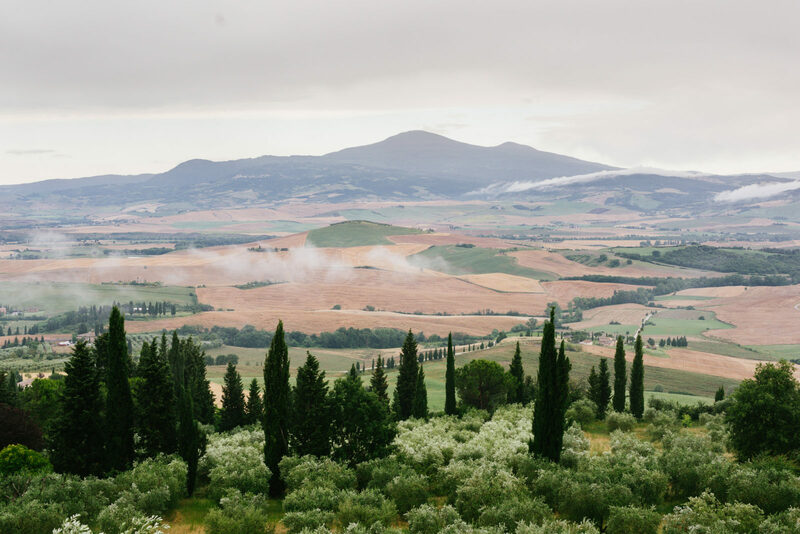 Signs of traditional Tuscan architecture began to reveal themselves with terracotta rooftops and sandy, crumbling stonework dissected with roses, and flanked by dizzying rows of grape-laden vines. To get to our most southern point, the UNESCO world heritage site of Pienza, we cruised through the valley D’Orcia bypassing (sadly for our wine glasses) Montepulciano and Montalcino for the walled Renaissance city—a fitting finale to the 20-hour-long halfway point for this epic FvF road trip. Located on the fourth floor of the hotel, the Flushing Meadows Bar has a terrace-view from which to drink custom cocktails by bartender Manu Pinciroli. Nestled between the Alps, the capital of Tyrol is framed by mountainous vistas. Towering over the city is the ski-jumping venue, Bergisel. Designed by Zaha Hadid, the concrete and wall-to-wall glass observation platform afford the best views of the city and daily ski-jumpers below. Gateway to the snow-capped Dolomites, Bolzano sits in the valley surrounded by vineyards and apple orchards. The colorful city is a mix of Gothic, and medieval buildings with ornate 15th century frescoes, turrets, and pastel facades lending a filmic quality to this alpine retreat. The capital of South Tyrol, Bolzano is a city at the gateway to the Dolomites and surrounded by lush green hills with vineyards and apple orchards. In the province of Siena, Pienza qualified as a UNESCO historic center. Described by UNESCO as “The first application of the Renaissance Humanist concept of urban design,” the town played a significant role in Italy’s urban development with particular attention given to Piazza Pio II designed by architect Rossellino. With thanks to The Flushing Meadows Hotel, Bolzano Tourism, La Bandita Townhouse, and Puscina Flowers for making the first half of our FvF road trip so magnificent. Our journey would not have been possible without our home on the road, the very generously loaned Mercedes-Benz Marco Polo Camper Van. Inspired to plan your own getaway? Flick through our travel stories or meet personalities from Germany, Austria, and Italy in our archive.